Earlier this year, around 8.3 billion straws polluted beaches, around the world. Schools, businesses, restaurants, and even cities, such as Seattle, have since banned plastic straws. Batavia High School should be the next to do so. Students at BHS are creating more waste each day and straws are a large part of this waste. Over 100 students use straws on a daily basis. “I restock the straws about three times and about 125 people buy drinks a day,” said Batavia’s barista, Christina Carrola. If Batavia High School eliminated plastic straws, almost 23,000 straws would be saved from our environment per year, and that just from the coffee bar! Secondly, People in the U.S. use over 500 plastic straws per day. They cannot be recycled so they must be disposed of in landfills, and many times they find their way into the ocean. They are, in fact, one of the leading causes of marine death. Conservationists predict that by 2050 there will be more straws than fish in the ocean. There are also some alternatives to plastic straws, that we could use at BHS include paper straws or going straw-less entirely. 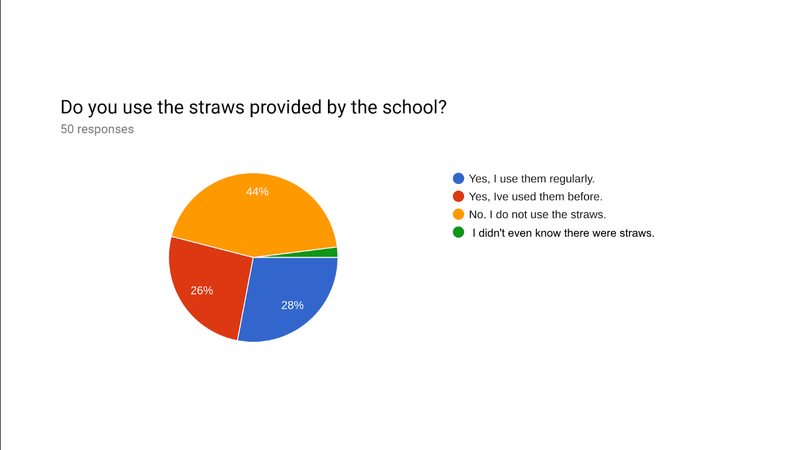 A random poll of 50 students in the lunchroom concluded that over half of the students surveyed do or have used the plastic straws, so finding an alternative is important. Paper straws would cost about a penny more than plastic but the impact on the environment is priceless. Going strawless would eliminate the cost altogether, which can be put toward other expenses. Whether or not plastic straws should be used is a very controversial topic. There are both ups and downs. Plastic straws are very cost efficient. “For a box of 500 straws it is $1.71,” said cafeteria manager Val Oleson. Plastic straws are also sturdy and last longer than paper. Eliminating plastic straws also has an unforeseen disadvantage for the disabled, such as people who suffer from autism, have had a stroke, or have a life-changing physical issue, but they can use a compostable straw as an alternative. ”Come up with an environmentally friendly replacement to straws, like cups that don’t require straws,” said freshman, Maya Malay. If Batavia High School stopped using plastic straws, our school could save money and produce less waste altogether. Also, our world would become a cleaner and less polluted place. Totally agree!! Save the turtles!